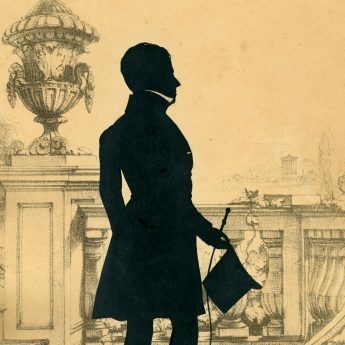 Finding himself exiled in England with a wife and young family to support, Augustin Edouart opened a shop in Cheltenham selling French curios and artificial flowers but the venture was short-lived and a bankruptcy notice was published in May 1826. He had also tried his hand at creating pictures of animals and landscapes out of hair. These found favour with HRH the Duchess of York who commissioned portraits of her beloved dogs. The work was, however, time-consuming and so failed to be cost-effective. 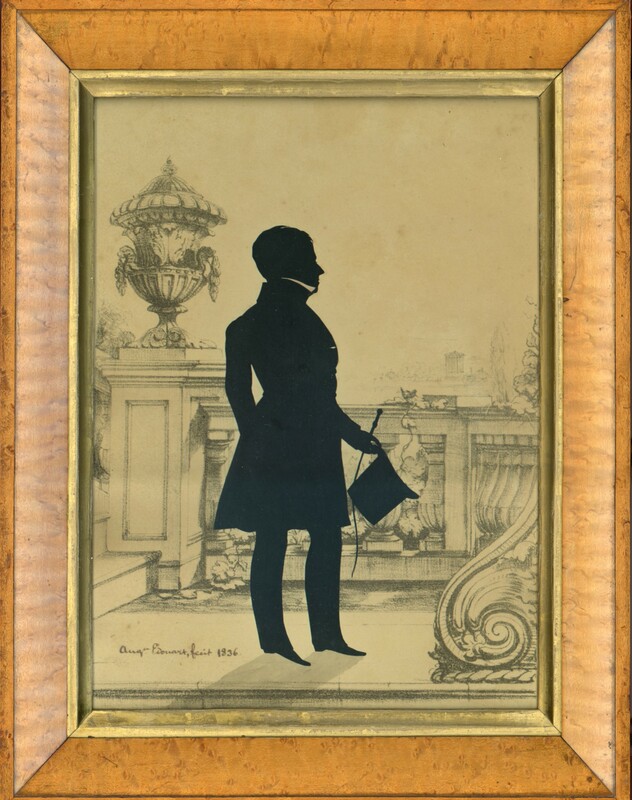 But all was not lost, as Edouart discovered that he had an aptitude for cutting silhouettes and, third time lucky, this venture proved hugely successful. Edouart spent fifteen years travelling around the British Isles cutting many thousands of profiles including many authors, musicians, politicians and royalty. 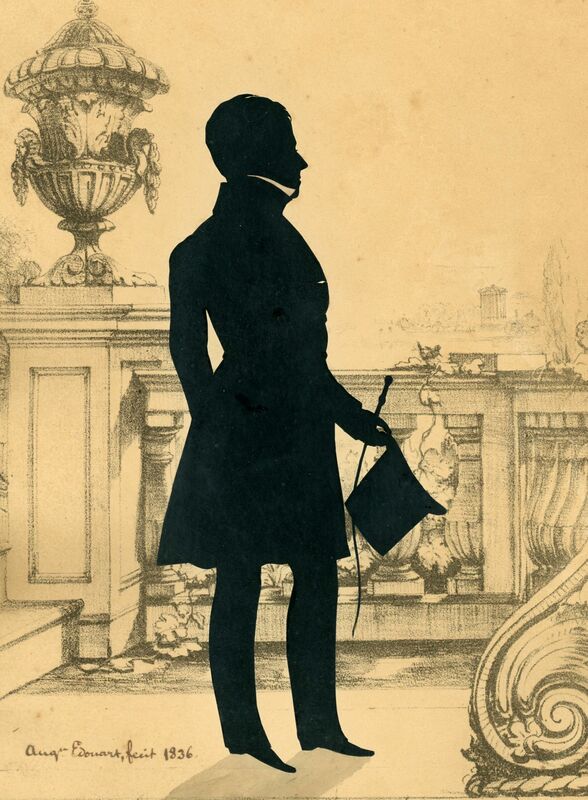 This silhouette is typical of Edouart’s work and shows a gentleman standing on a balustraded terrace, top hat and switch in hand. The profile is cut as a single piece and demonstrates several of Edouart’s artistic traits including a cut-out buttonhole, the cut away shirt collar, the slashed hair, and the eyelash. All Edouart’s sitters, including dogs, have cut eyelashes; the only known exception to this was when he cut profiles of some blind children at a special school in Belfast. The silhouette is laid on a lithograph base with a classical folly in the distance. 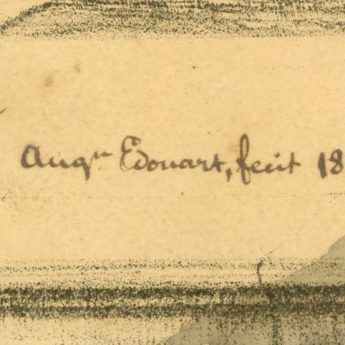 It is signed “Augn Edouart, fecit 1836”. 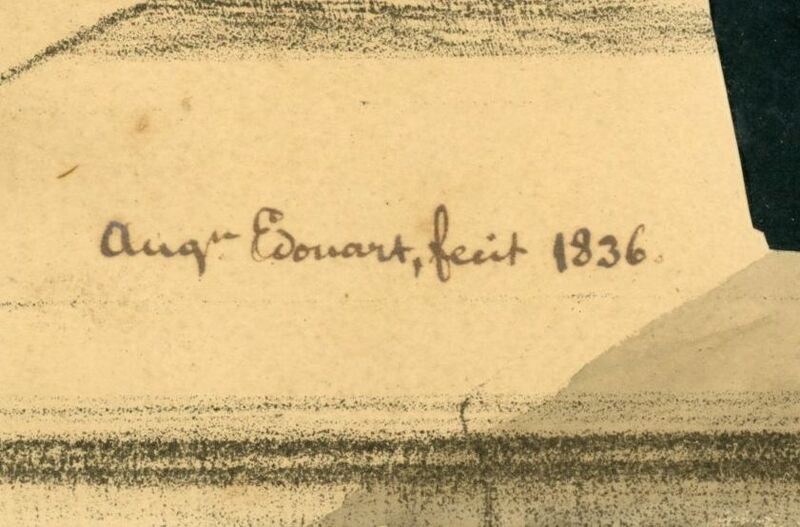 Edouart is known to have been located in and around Cheltenham and Gloucester for at least part of that year. The silhouette resides in the original bird’s eye maple frame. From his Treatise (Longman, 1835), we know that Edouart was particular about his choice of frames – “I took the resolution to frame, in consequence of the unpleasant results that occurred, when the persons themselves were obliged to have them done …”.